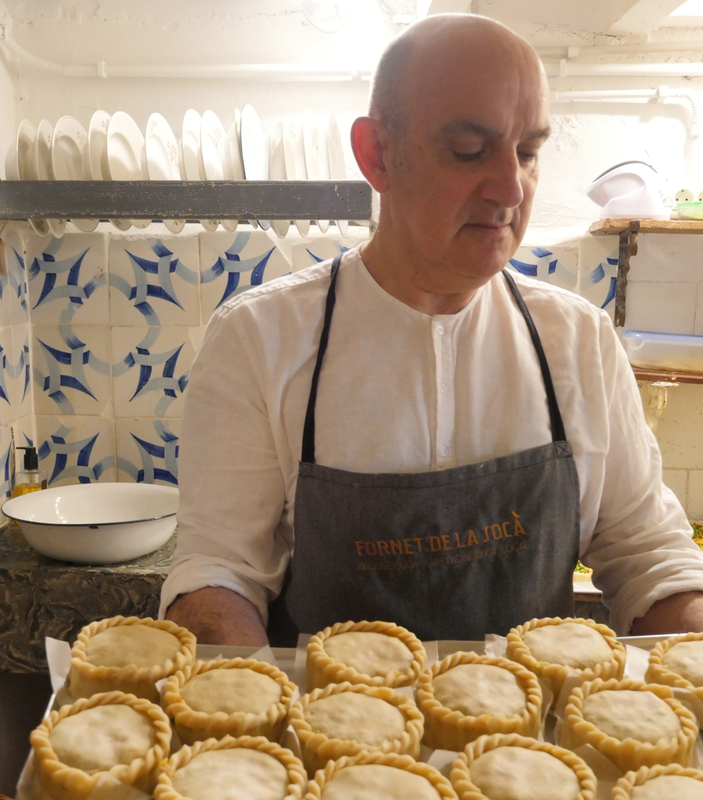 I’m standing on the stairs leading down to an ancient kitchen in one of Palma’s bakeries, Fornet de la Socà. 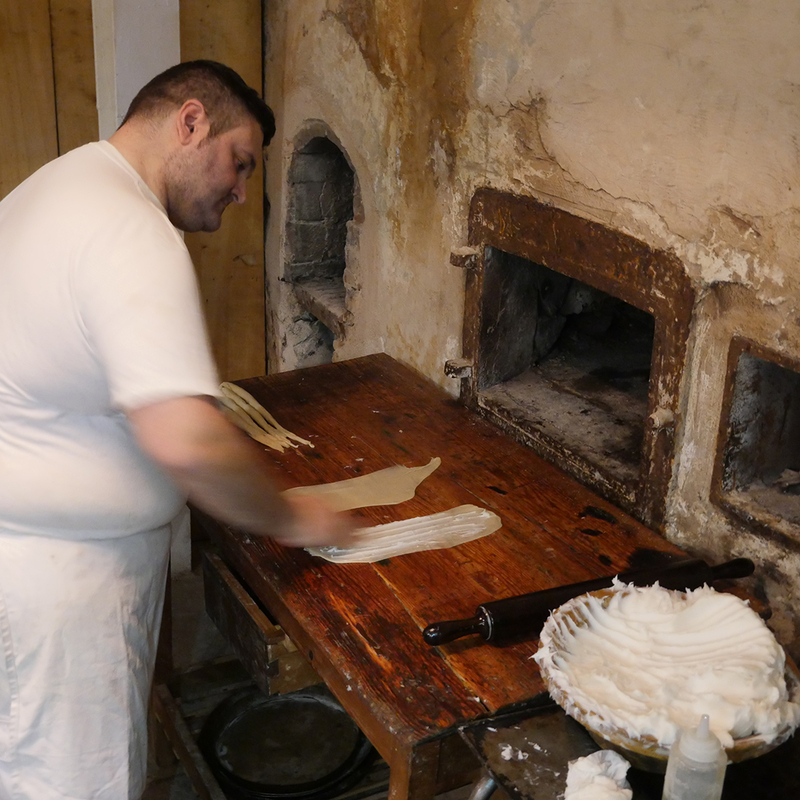 The baker standing in front of the now disused wood oven, the oldest in Palma, is carefully teasing out his dough for ensaïmada. There’s a large pot of lard to one side and he’s stretching out filo pastry thin sheets of the dough on an olive oil covered board, then coating it with lard using his fingers, making sausages of the strikingly white sheets, then coiling each one up before laying out each spiral in ensaïmada format, like a large bunch of roses. The result, we learn, will prove for 24 hours. And, classically it’s a dough that is made by including some of the left-over dough from a previous batch rather than yeast. So, the end result is something like a cross between sourdough and flaky pastry. That long, slow, cold proving together with the ‘saïm’ (pork lard) coated dough that creates the light as a feather, slightly flaky, slightly soft ensaïmada. 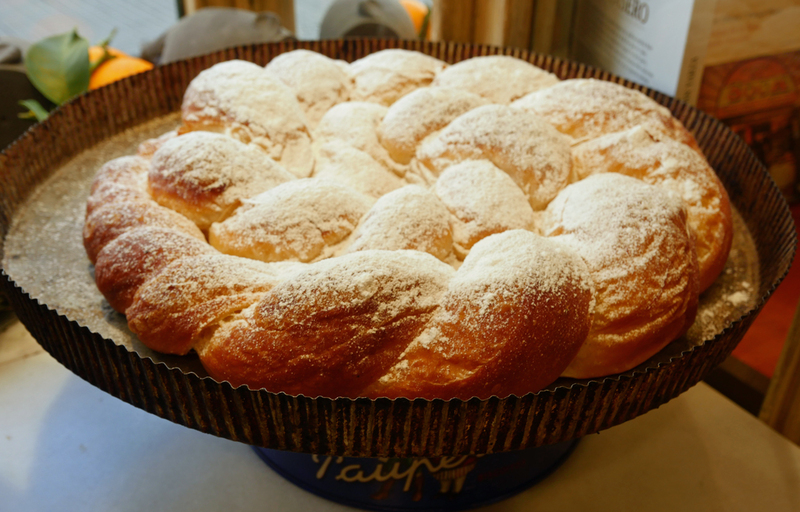 Savoury with sobrasada or sweet with sugar and egg custard, this one of the most famous dishes you’ll find in Palma. You’ll find yourself eating ensaïmada every morning for breakfast. It’s unexpectedly addictive and utterly delicious. Dating back at least to the 17th century it has been IGP registered since 2003. 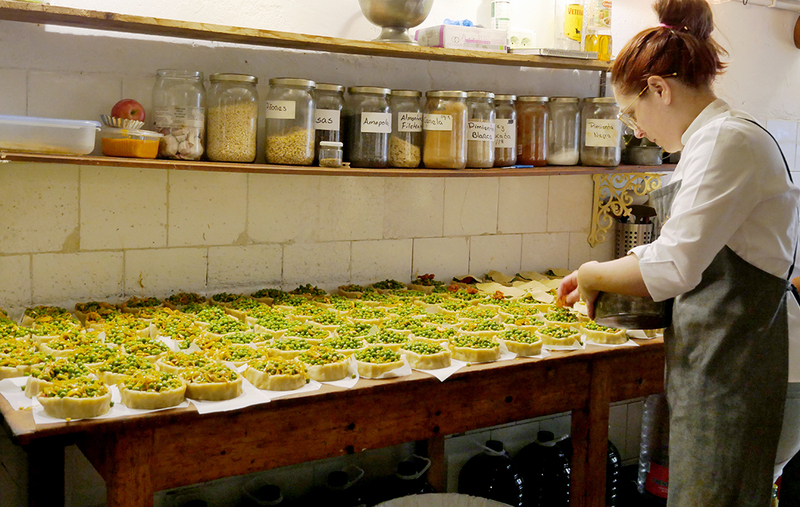 You’ll find Panades there too – traditional deep pastry pies filled with meat and peas. Warm from the oven they are a great option for lunch on the go and very moreish. And Coca de Trempó, which at first glance you might think is pizza. But the crust is a hybrid pizza dough/pastry. It does have yeast, but the rising time is minutes not hours and the dough, once rested, is rolled out into an ultra-thin base for toppings – red and green peppers, onions, fresh tomatoes and parsley but no cheese. 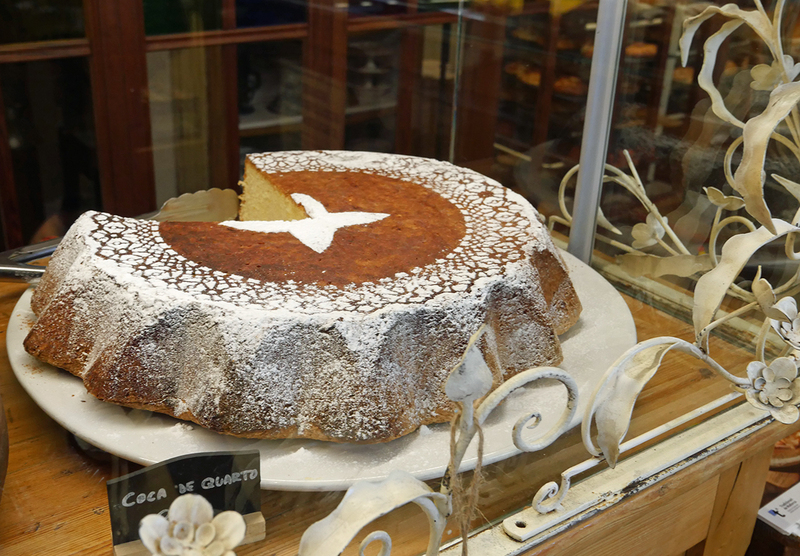 Variations of Coca exist all across Catalonia – there are sweet and savoury recipes and versions that include meat. 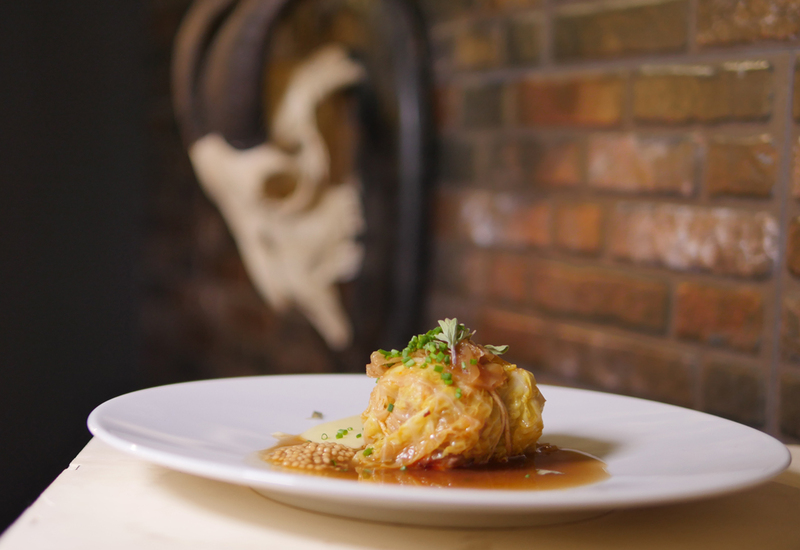 Clandestí is both restaurant and culinary experience. 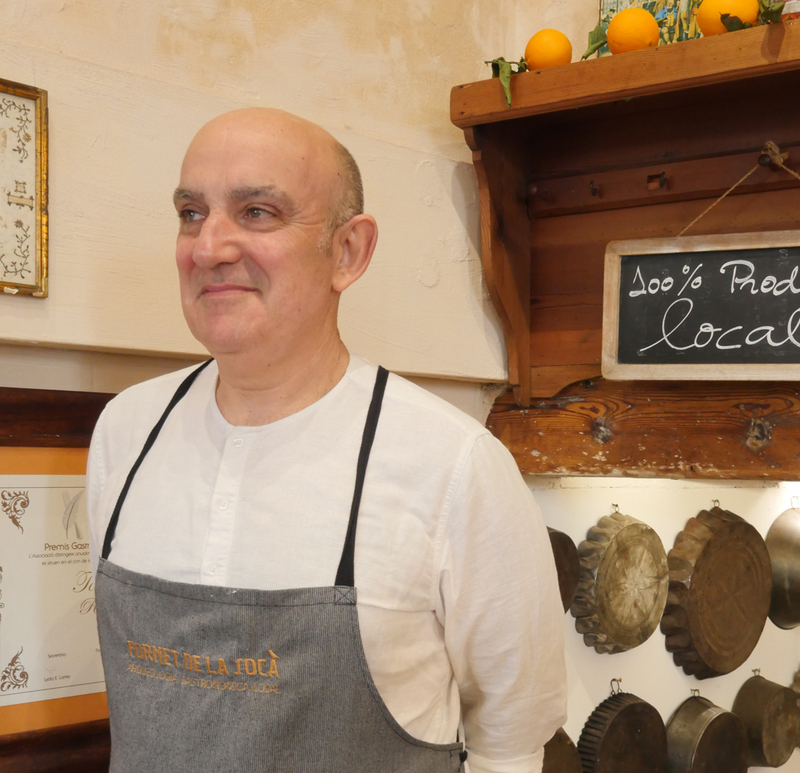 You can visit for lunch or dinner and enjoy a menu of traditional Mallorcan specialities cooked for you by an enthusiastic group of chefs who want to showcase and explain more about Mallorcan food. You can also enjoy a cookery class (maximum of 12 people both for dinner or the class) – we went along to find out more. The first dish we tried our hand at was indeed a Coca. Our chef explained that they prefered to use traditional Mallorcan flour which gave the end result a kind of nutty quality. We attempted one or two other dishes including llom am col, a dish of pork loin with sobrasada and botifarró. The authentic version would be slow-cooked with tomatoes, wine, pine nuts and raisins in a clay pot. 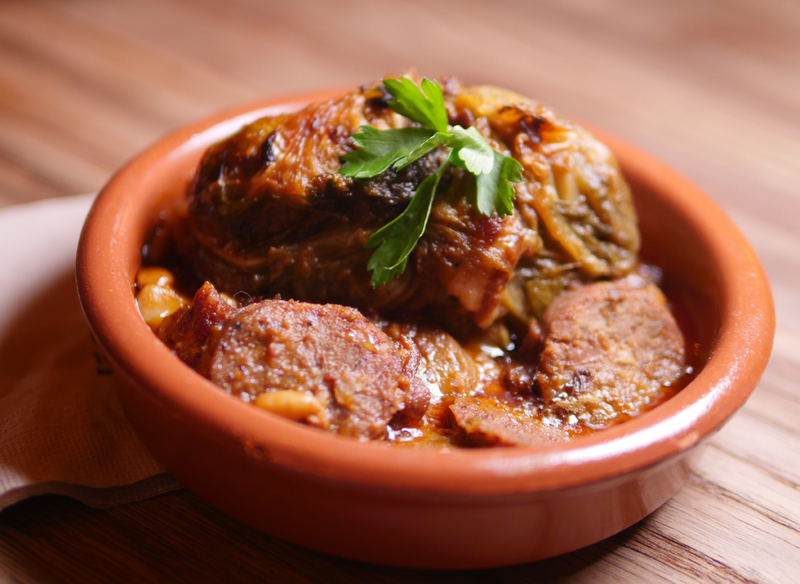 We also tried the same dish at Mercat 1930, a fabulous place to spend an evening eating and drinking, where you’ll find a whole selection of local dishes served tapas style. And we found llom am col ready-made for the busy Mallorcan housewife for sale at the market. Its popularity perhaps comes from the quality of local pig – free range Negre Mallorqui, Mallorcan black pig. Beyond the bakeries, perhaps the best place in Palma to start getting a feel for the cuisine of Mallorca is at one of the markets. 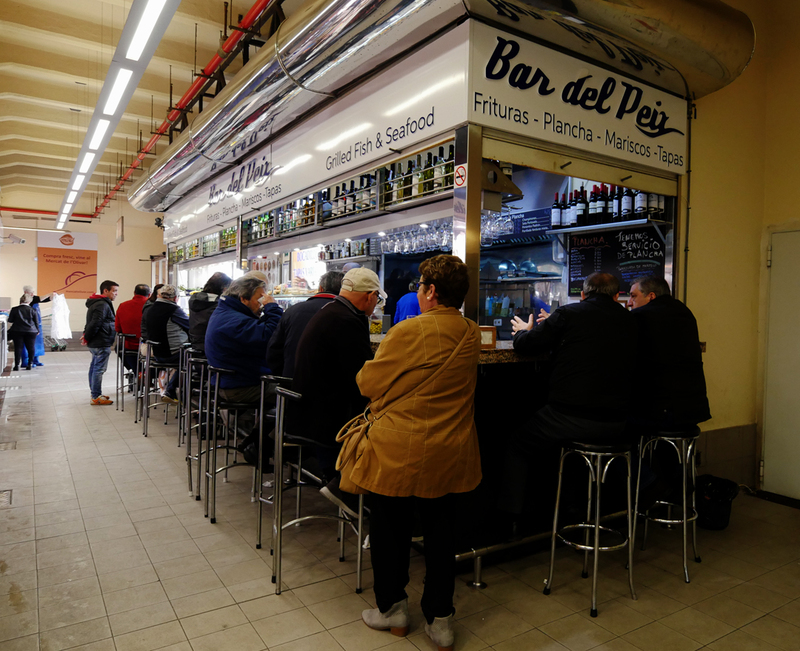 We spent some time with a local guide exploring the covered market, Mercat de l’Olivar before going back to his restaurant to cook and eat some of our purchases! It’s a place where you’ll definitely be reminded that Mallorca is an island, with a large number of fish stalls. 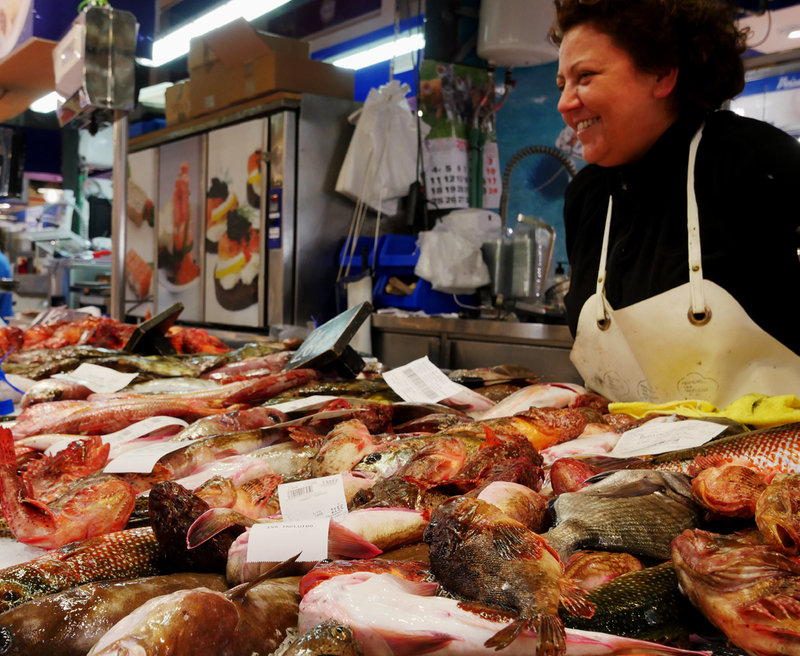 You’ll find all kinds of fish and shellfish there including mixed fish sorted by size into massive piles, some of the unfortunates still flapping gently, marked for Sopes de Peix Mallorquines – Mallorcan fish soup. 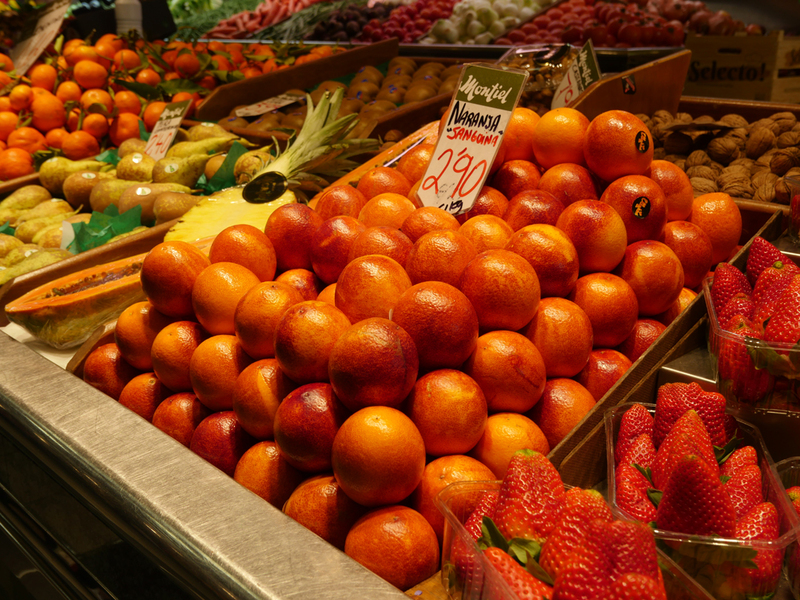 You’ll also find plenty of fresh fruit and vegetables, fresh meat including porcella or suckling pig, and a whole range of local wines, olive oils and olives. 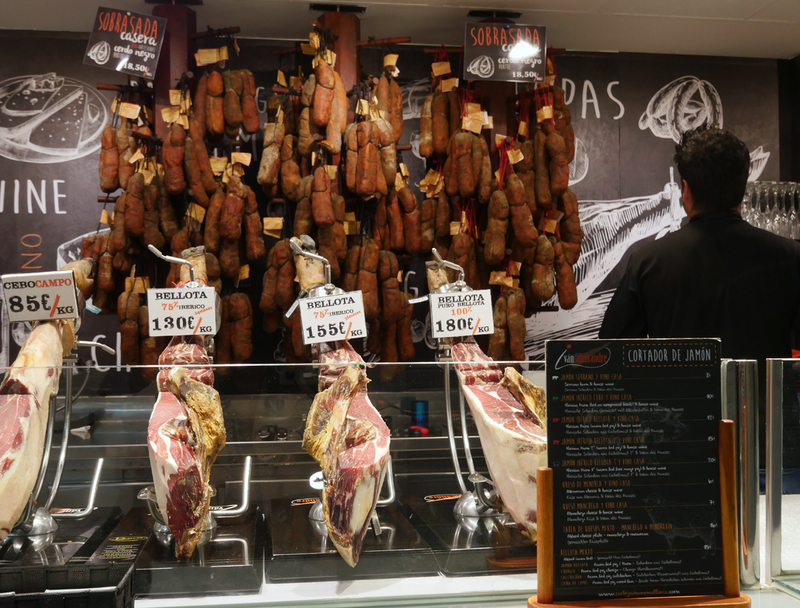 And, of course, there are plenty of places to buy charcuterie. 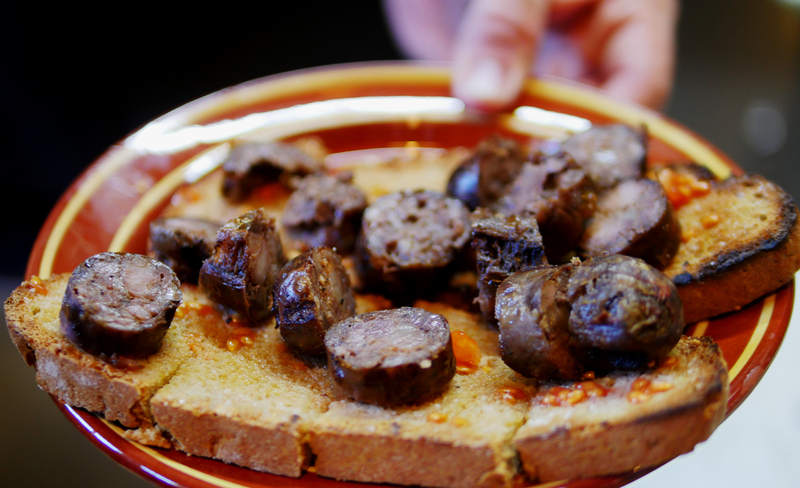 Botifarró is a traditional Mallorcan pork sausage that is a little like a hybrid of chorizo and black pudding, made with blood and liver and spiced with fennel. White botifarró is made without blood and spiced with cinnamon and nutmeg. Both are raw and need to be boiled and/or grilled before being enjoyed with bread or in traditional dishes like Sopas Mallorquinas – a dense bread and vegetable soup that is closer to a stew and is varied according to what vegetables are in season. 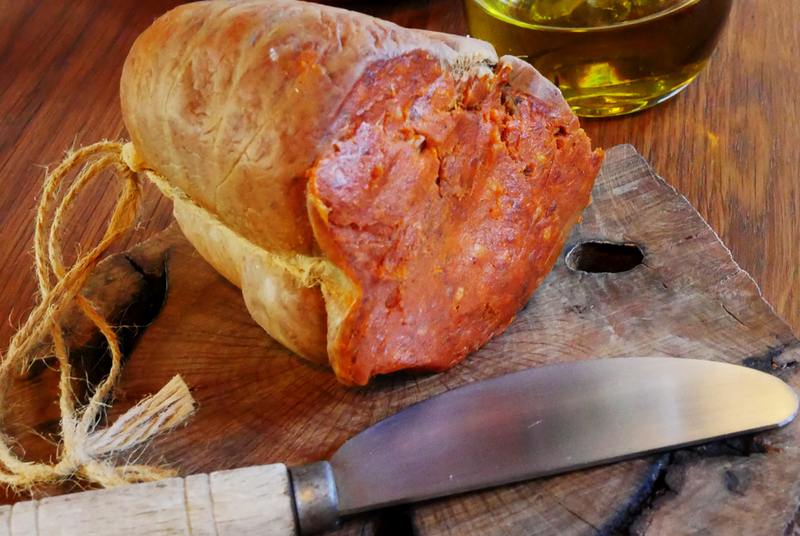 Sobrasada is also used to enrich Sopas Mallorquinas, a cured pork sausage spiced with paprika and cayenne and seasoned with local herbs that to me was closer to Italian ‘nduja. Another IGP product, its unique texture comes from the island climate and the uniquely fatty Mallorcan black pig which results in a soft sausage. Other specialities? Like most places in Spain, Mallorca has its own rice dish, Arròz Brut – or dirty rice. The brown colour comes from the range of relatively ad-hoc ingredients – rabbit or chicken liver and meat, pork meat, sobrasada and botifarró together with whatever seasonal vegetables are available. And, there’s a special spicing, called four spice, which really shows some of the Moorish culinary influences – cinnamon, cloves, Jamaica pepper and nutmeg together with salt and pepper. Traditionally cooked in a greixonera (clay cooking pot), the end result is a kind of cross between spicy paella and risotto. It’s delicious though and a perfect way to use seasonal and local ingredients. Then there’s tumbet, a Mallorcan version of ratatouille. 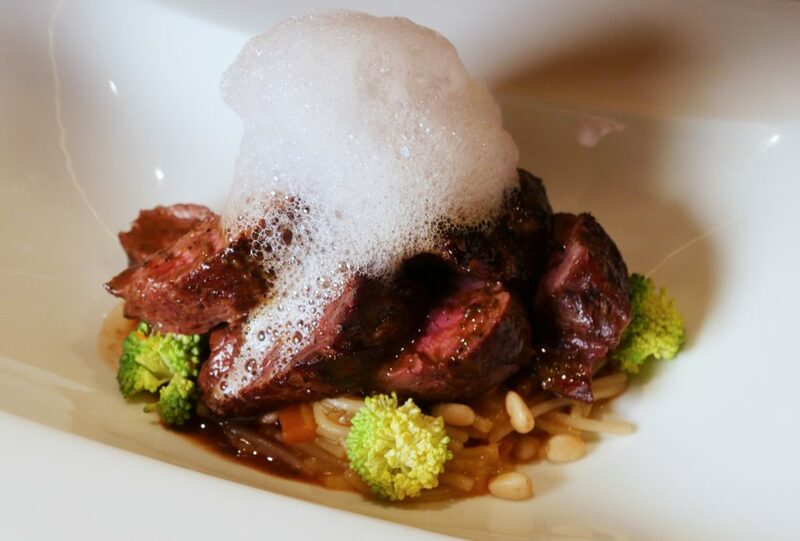 Frito Mallorquin is traditionally pan-fried, made with vegetables from the island that have been stuffed with lamb’s liver and meat. 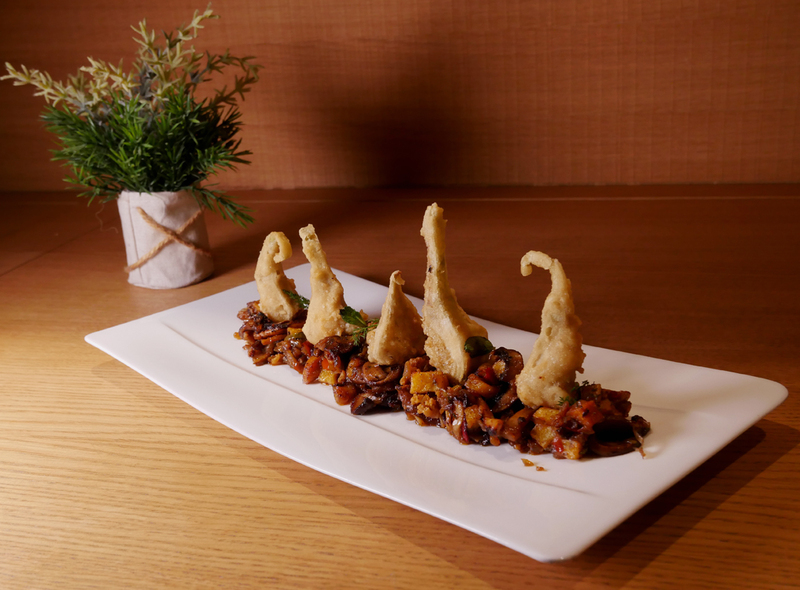 The version we tried, in the refined and rather excellent Cuit restaurant at the Nakar Hotel, was vegetarian and carefully topped with deep fried tempura artichokes. And there are any number of specialist bakes. Mallorca is the largest of the Balearic islands, in the Mediterranean off the North coast of Spain. Barcelona is 128 miles as the crow flies, while Algiers is 198 miles away. For centuries the Balearic islands were fought over – by Phoenicians, Romans, Moors and Catalonians. 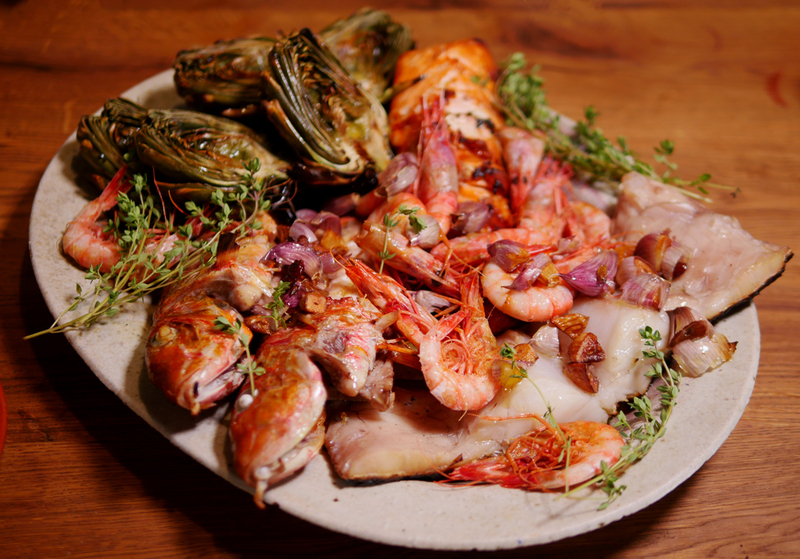 The result is a cuisine with the influence of both Catalan and Moorish cuisines – and with unique island dishes that have evolved to make the most of the natural resources – olives, citrus fruits, vines, almonds, and grains grow well on the flat central plains of Mallorca and the seas are a rich source of food. Mallorca is a great place to challenge your tastebuds and eat something new. There’s a wealth of local produce and traditional cuisine is popular and widely available. With a great cafe and bar culture, you won’t need to spend a fortune to explore and stretch your boundaries. Also open for groups from 10pax according to availability. I stayed at the Brondo Architect Hotel Calle Can Brondo 207001, Palma de Mallorca, Balearic Islands Spain. Rates start at around £70 in low season rising to £250 in high season. Breakfast is 16 euros. I’ve written a feature so you can easily find out more about my stay at the Brondo Architect Hotel in Palma. For more about the heritage of Palma de Mallorca, find out about the emblematic shops too.